The Crossover Universe: Crossover Cover: Who's Scared? When the Scarecrow douses Mystery, Inc. and the Mystery Analysts of Gotham City with his fear gas, it’s up to Scooby-Doo and Ace the Bathound, who as non-canines are unaffected by the drug, to save the day. The Mystery Analysts present for the meeting include Batman and Robin, Roy Raymond, Mysto, Doctor Thirteen, Kaye Daye, Slam Bradley, and Jason Bard. Paintings of Detective Chimp and Sam Simeon are also seen. Roy Raymond, TV detective, appeared in Detective Comics from 1949–1961. Mysto, Magician Detective appeared in his own back-up feature in the same series in 1954. Doctor Terrence Thirteen, “the Ghost-Breaker,” appeared in Star-Spangled Comics from 1951-1952. Kaye Daye is one of the original Mystery Analysts of Gotham City that appeared in Batman in the 1960s and 1970s. Slam Bradley appeared in Detective Comics from 1937–1949. Slam’s older brother Biff Bradley was involved in an affair on Dinosaur Island alongside several other adventurers in 1927, as seen in Guns of the Dragon, while Slam himself had an adventure with the third Batman and Robin team, the Elongated Man, and an elderly Sherlock Holmes in 1986, as seen in “The Doomsday Book.” Jason Bard first appeared in a Batgirl story in Detective Comics in 1969 before spinning off into his own back-up feature, which ran until 1973. Detective Chimp (Bobo, a chimpanzee skilled at solving crimes) had a back-up feature in The Adventures of Rex the Wonder Dog from 1952–1959. Sam Simeon, a talking ape who works as a P.I. with the curvaceous and brilliant Angel O’Day, was featured in the comic Angel and the Ape. These characters are all CU counterparts of their equivalents in the DC Comics Universe. Dr. Thirteen is interesting since he was originally a skeptic who was always proving the supernatural events he investigated as hoaxes. This became weird when he was integrated in the DCU where the supernatural not only exists but blatantly so. An appearance in a Scooby Do Comic seems appropriate though. The number of talking apes (well, simians) tripled in the CU thanks to this issue. That may cause trouble with the world outside you window rule in the CU. Then again we already have a talking dog (thanks to Farmer himself) and I believe Detective Chimp did not originally talk. The rest of the characters fit in the CU since they seem standard pulp type detectives. By the way is this the first connection to Jason Bard? 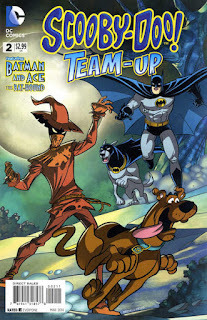 "Scooby-Doo and Ace the Bathound, who as non-canines"
I think you mean as canines or maybe non-humans. D'oh! Yes, I meant non-humans. I'll correct that passage in the manuscript. Good catch, thanks!